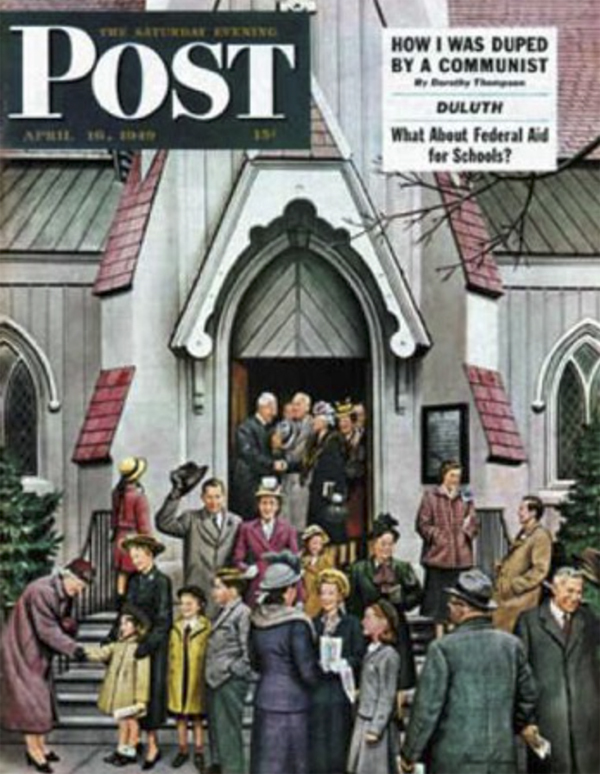 The cover of the April 16, 1949 Saturday Evening Post, which featured the accompanying article about Duluth by Arthur W. Baum. The following article by Arthur W. Baum first appeared in the Saturday Evening Post of April 16, 1949. The citizens of nearly every hub city, or zenith city, or queen city must sometimes be upset by the outsider’s inability to understand the importance of their community in the cosmic scheme. No matter how carefully chamber-of-commerce charts and circles prove that Los Angeles or Dallas or Springfield is the very dead center of everything, the universal disbelief of strangers beyond the city limits must produce uneasiness. Which makes the case of apple-cheeked, blue-eyed, tow-haired Duluth, third city of Minnesota, unique. For Duluth has not had to worry about outside acknowledgment of its spot on the globe since January 27, 1871. On that day an obvious stranger, Rep. J. Proctor Knott, of Kentucky, announced in Congress that Duluth was “pre-eminently a central place.” Said Knott, “Duluth is … so exactly in the center of the visible universe that: the sky comes down at precisely the same distance all around it.” This backhanded crack was delivered in one of the greatest satirical speeches ever heard in Congress, one in which Proctor Knott, attempting to block the grant of lands for a railroad into the Duluth area, flayed the infant city so witheringly that Congress extended its session to hear a few more bits of skin ripped off. It does not disturb Duluth in the least. Proctor Knott was proved so wrong, so often and so soon, that Duluth soberly regards every barb he threw as a serious prophecy. The city not only forgave him but later entertained him while he viewed his errors on the spot, and named a suburban community after him. To be a little more precise than the Kentuckian, the city of Duluth ties at the most westerly point, of the largest, unsalted sea in the world, Lake Superior- a fluid deity which the city worships to a man. At every season of the year the sun rises on Duluth over the cold blue water or the gray ice of this inland sea, so vast that it has little tides. Hiawatha called it “Gitche Gumee, the shining Big-Sea-Water.” At its sharp western nose, where it is fed by the St. Louis River, is the very headwater of all the Great Lakes, 603 feet above the ocean. Up the middle of the bay of the St. Louis and up the river for a way, the states of Minnesota and Wisconsin border each other. Across the river and inner bay behind a nine-mile sandbar, there is a perfectly logical place for a city. In fact, one is there -Superior, Wisconsin. That Duluth, rather than develop in comfort on the grassy flats where Superior lies, chose to buck the unlikely cliffs on the north shore is quite in character. Duluth’s history is a long series of counterpunches at circumstances and events. When Duluth wins a round, it habitually comes up off the canvas to do it. Placed originally on the wrong side of the river, it was the least promising of six villages. It engulfed them all. Ridiculed before the nation by Proctor Knott, it heard him recant fully. Failing flatly as a city on its first try, it had to start all over again more than a decade later. The gold and copper it hoped to find in its hinterland were elsewhere, and it had to settle for mere timber. But in taking the timber it stumbled upon a whole destiny in iron. And with the world’s greatest iron deposit, the miraculous Mesabi Range, in Duluth hands, the local ownership was promptly lost to Easterners. She’s down, she’s up. The iron that made Duluth, after a half-century gave warning of coming exhaustion and promised to unmake it, and just at this critical point the late war squeezed the Mesabi harder instead of less hard. The Lake Superior iron ranges had to provide 80 per cent of the steel thrown into the war by the United States, which was most of the Allies’ steel. But in the shadow of this tragic depletion, Duluth has now discovered a possible new century of hope in abundant lower grade ore. If techniques for handling the leaner ore improve just enough, great beneficiating plants and increased pay rolls may appear in the iron ranges for which Duluth is supplier, outlet and shopping center. By surviving this continuous stream of stumbles and recoveries over almost eight decades, Duluth has reached a population of about 105,000, achieved a firm industrial underpinning, captured a huge tourist business-including a large bloc of the nation’s hay fever sufferers-and has built a port whose annual tonnage is second in America, exceeded only by New York.